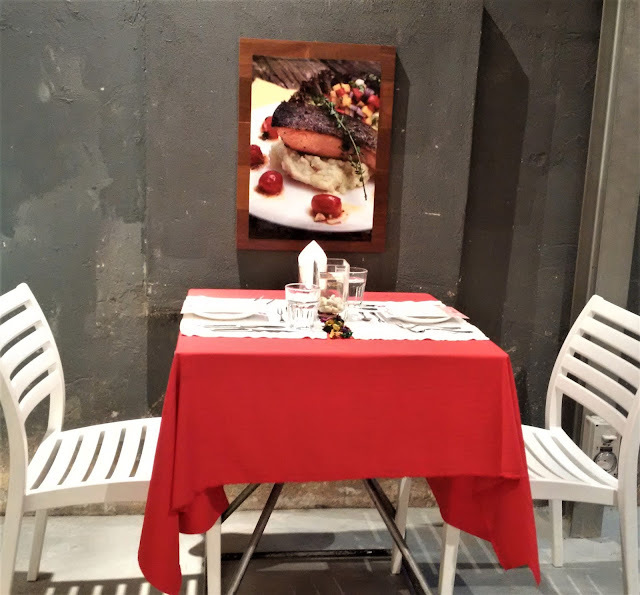 Love is on the menu this Valentine's Day at Em by Tedboy. 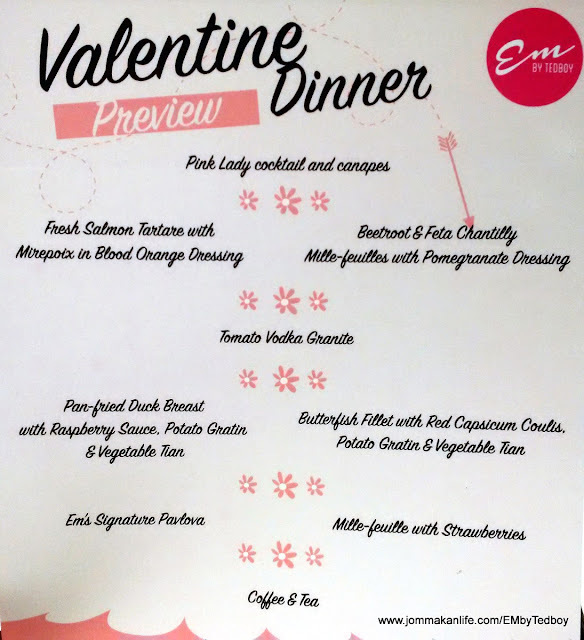 Named after Mathilda, the cherubic second child of the couple who owns Tedboy Bakery in Bangsar, the cosy Em by Tedboy at Hotel Transit KL aims to lure lovebirds this Valentine's Day with a special celebratory set menu (RM168+10% service charge) for two persons. Austere décor and neutral tones are prevalent throughout the restaurant confines, evoking a casual yet welcoming atmosphere. Consultant chef Pierre MC (formerly of Croisette Cafe) has been roped in to conceive a Mediterranean inspired menu with Asian influences. By and large the pared-down industrial vibe is softened by a feature wall depicting a world map. Snapshots of guests from around the world affixed on different continents bear testament to the outlet's increasing popularity among international travellers to our city. Now, the strategy is to boost awareness and attract a more constant and local clientele to its doors. Well, Valentine's Day seems a perfect occasion to ignite their interest. 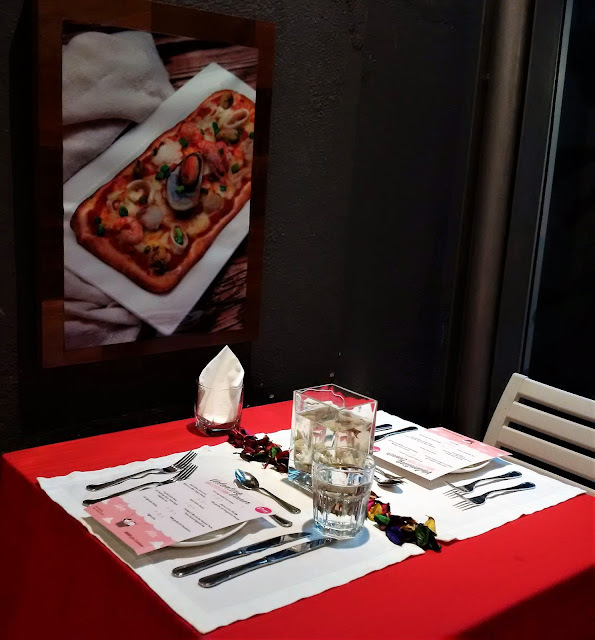 For the lovely celebration, expect the tables to be prettied up with red tablecloths and white placemats, dried floral petals and a glass receptacle holding a pair of live guppies and ornamental pebbles as the centrepiece. To fan the flames of romantic fervour, we sipped on a heady Pink Lady cocktail accompanied by a quartet of canapés. The concoction of cranberry and lemon juice mixed with triple sec and vodka sent our pulses racing so go slow if you're unused to boozy tipple. Handy, dainty servings of savoury pesto-infused rice, black olive tapenade on crusty bruschetta, a mini frothy glass of cream of mushroom and prawn with mango salsa from the tempting canapé platter should pave a deliciously smooth pathway to both you and your beloved's tummies. I was particularly besotted with the springy and mildly smoky prawn coupled with the heartwarming mushroom soup. Butterfish melded with raw and smoked salmon, and salt-cured cucumber with dill to create the palate-teasing Fresh Salmon Tartare with Mirepoix in Blood Orange Dressing. The resultant flavours were delicate with the natural fresh sweetness of both fishes intact, and textures bordering on the soft almost satiny finish. Instead of the classic French trinity of carrot, onion and celery for mirepoix, the chef added colour to the dish with diced tomato, chopped hardboiled egg and feathery sprigs of dill. For the masculine diner, a lush Beetroot & Feta Chantilly Mille-Feuilles with Pomegranate Dressing beckons. Although beetroot doesn't top most guys' list of preferred food, the speciality tasted way better than it sounded. My dining partner would vouch for its delectable appeal after sampling the subtly sweet-savoury-briny stack. Zippy bursts of heat set our tastebuds alight Tomato Vodka Granite. A punchy palate-cleanser that either have you succumbing to the gritty coolness or reeling from the alcoholic suckerpunch. 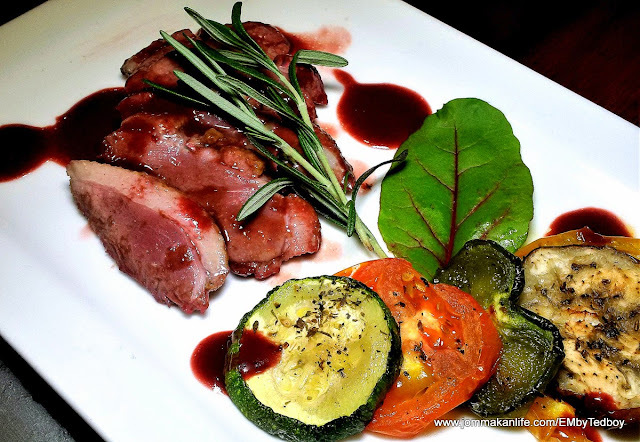 Main course that should go swimmingly well with fair ladies is Fried Duck Breast with Raspberry Sauce, Potato Gratin & Vegetable Tian. Tender with a thin strip of fat on top, we found the duck's gaminess barely discernible thanks to the faintly tart raspberry sauce. Herb-flecked slices of baked vegetables and potatoes served as supporting cast. 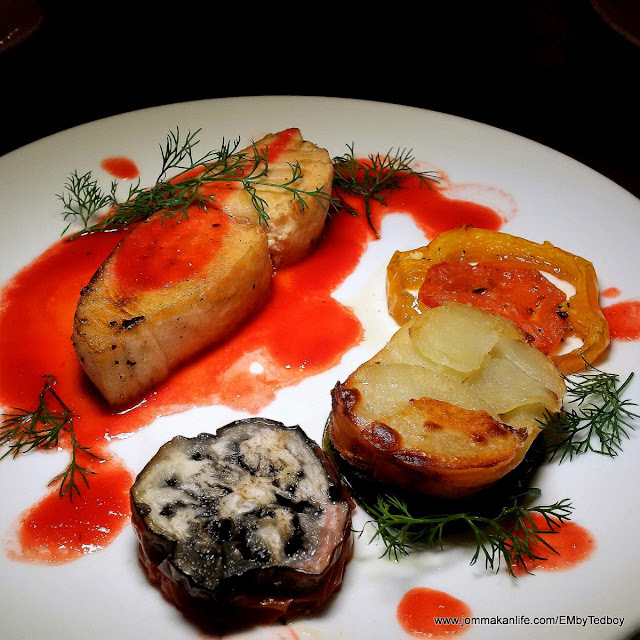 Alas, the dish was no match for the show-stealing Buttefish Fillet with Red Capsicum Coulis. We thought its vibrant saucy red looked more feminine compared to the darker shade of the ducky option. The fish was cooked just nice, rendering it firm yet flaky; contrasting well with the hearty potato gratin and tian of veggies. Light yet luscious, Em's Signature Pavlova wrapped up the fairer side of the dinner set. The inclusion of fresh kiwifruit, blueberries, strawberries and a gooseberry coupled with raspberry sauce ensured this fanciful treat worth relishing. Somehow the dessert appeared sweeter on the other side...I personally displayed a greater penchant for the Mille-Feuille with Strawberries. Juicy and slightly tart, the fresh strawberry halves embedded in pastry cream and sandwiched in between crisp mille-feuille were sublime. 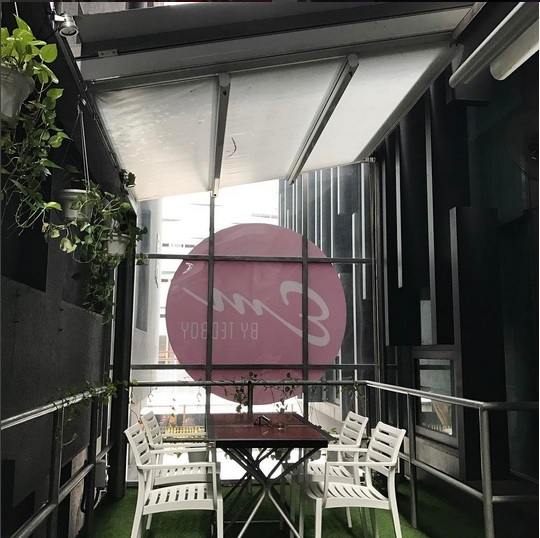 Event planners seeking a suitable space for meetings, breakout sessions, birthday parties or product launches are welcome to ask Em by Tedboy about its dedicated event corner upstairs. Hidden by a partition door and up a short flight of stairs, the rectangular open air, garden-like space is outfitted with retractable canopy to protect it from the heat and rain. Furnishings are tactile for flexible configurations desired by event organisers and party hosts. For reservations, please call EM BY TEDBOY, tel: 03-2022 2056. 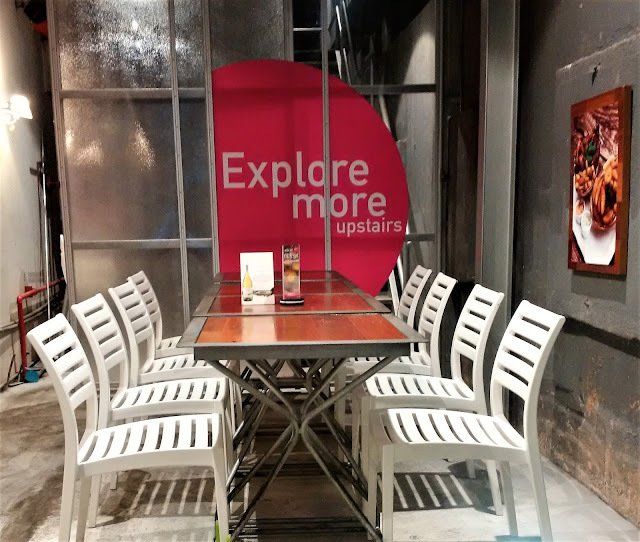 Address: Ground Floor, Hotel Transit, No.42, Jalan Pudu, Kuala Lumpur. Happy Valentine's Day to you & Ching!